Introducing JACK: the quickest and easiest way to manage the administrative tasks in your business that stand in the way of your free time. This web-based software helps you stay organized, saving you time and money. Hire JACK and get your life back! This summer I bought a boat... and used it! Thanks, JACK, for giving me my life back. I now have all my information with me wherever I am. I get home at night sooner and I don’t have to spend all night at my computer catching up on paperwork. My husband did his own laundry for the first time in 10 years. He may not like doing laundry, but it is better than paperwork. Q: How much does JACK cost? JACK can be purchased in one of two ways: either upfront or as an ongoing monthly subscription. Either way, JACK is an inexpensive solution starting at just $99 per month*. And as an added bonus, JACK is always up to date, as your purchase of JACK qualifies you for free, unlimited software upgrades for as long as you are using the product. *The price depends on the package chosen. Not all packages have the features as advertised. Q: How do I access JACK? JACK can be accessed over the Internet by any computer or device with an Internet connection and a modern browser*, including Macs, PCs, and iOS devices such as newer iPhones and iPads. JACK may also work on other devices such as Blackberry, Android, or Windows smart phones or tablets, however, he works best on the devices first described. Yes, all of your information is safe and secure. In fact, it is backed up several times a day and is just as secure as shopping online with your credit card. Don't worry, you can trust JACK. Q: What size of company is JACK for? JACK can be used in any size of company. So whether you are a one-man-band or you have several different crews, JACK is your man to keep you organized with different packages and pricing to suit your needs. Contact Us for more information. Q: How long does it take to get JACK up and running? JACK is an extremely easy-to-use system that requires very little training. As a result, you can be up and running with JACK in minutes! Of course if you need some help getting set up, we are more than happy to walk you through the process, showing you how to get the most out of your team's new MVP. Q: JACK doesn't have a feature I'm looking for. Can it be customized? Yes, JACK is 100% customizable. 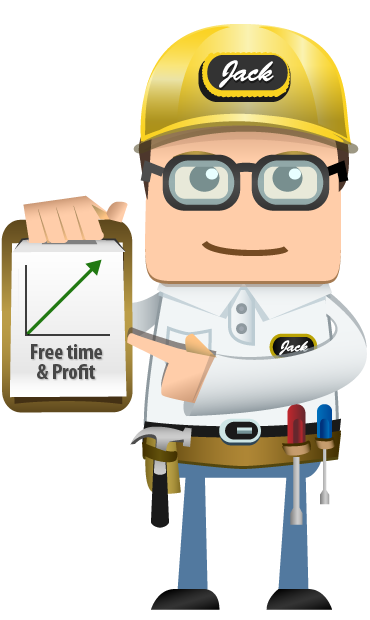 Whether you are looking to add features to correspond to your unique business practices or you want JACK to interact with another system that you are using, we can work with you to train JACK to do whatever you need him to do. Extra costs may apply. Q: Is it possible to import my old data into JACK? Yes, we can import almost any type of data into JACK - even if it is only on paper. Our team of technology professionals can work with you to ensure that all of your data is input correctly. And if you're pressed for time, we can do it all for you! Extra costs may apply. Web-enabled software built for Plumbers, Roofers, Drywallers, Electricians, Landscapers and other trades. Schedule and Track all aspects of your business including estimates, jobs, inventory, employee hours, payroll and more in this easy to use software. JACK, powered by Innovatis Inc.
Or fill out the form below so we can contact you!